Gareth Potts Montfort Pool Table - 7ft, 7.2ft, 8ft | Free Delivery & Installation! The Gareth Potts Montfort Pool Table comes with Free Delivery and Installation (worth £500), over £150 of Free Accessories, and is exclusive to Home Leisure Direct. The Gareth Potts Montfort is an English pool table using 2” red and yellow balls as standard, with a one piece or three piece slate bed, available in 7ft and 8ft sizes. The Gath Potts Montfort is based upon the Lancaster, which is a part of the Tradition Range from Billards Montfort, and is manufactured in solid oak or solid beech. Its modern yet refined style will fit in perfectly with many types of décor. The Gareth Potts Montfort has a metal frame construction, with solid wood legs, frame and cushion rails. The slate bolts onto the main support frame, and the top frame and cushions bolts directly down onto the slate. This provides an incredibly solid, secure and stable playing surface, which will reward you with incredibly accurate and responsive playing characteristics. 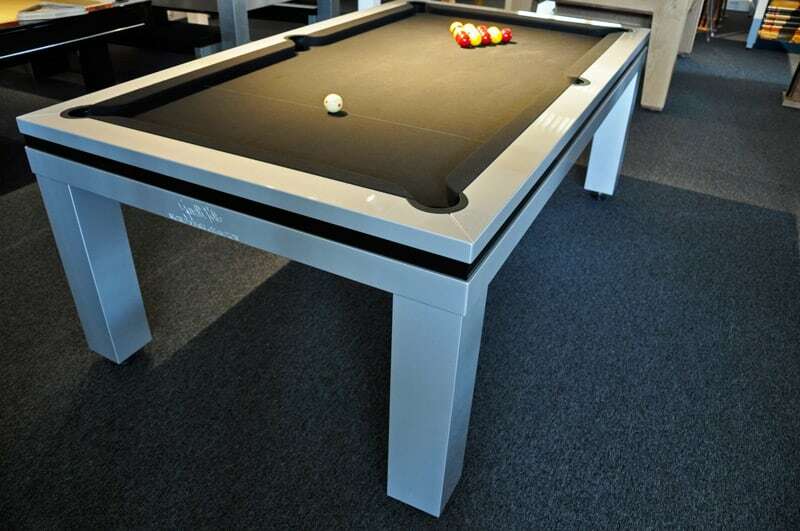 This is both an awesome pool table, and a wonderfully stylish choice as a dining table, should you wish to make dual use of it with the optional dining top. The Gareth Potts Montfort is available in either English Pool, American Pool, or Carom (very popular in France, South America and Southern Asia). If you fancy checking out this incredible and unique Gareth Potts Montfort Pool Table in the flesh, then pop into our showroom in Bristol, when you have a chance. We have the 7ft American Pool version of the Gareth Potts Montfort on display, fitted with black cloth. A visit will allow you to get a real feel for the quality of a Montfort table. Pop in and play a frame or two with our staff! The Gareth Potts Montfort pool table comes in silver with black trim, featuring Gareth's signature. By default, the Gareth Potts Montfort comes with black cloth, per Gareth's taste. However, if you prefer you can choose a different colour from the below options. The complete range of table top designs is displayed below, but your table top can be made in the colour you desire to match your décor. Please contact us on 0800 622 6464 or 01454 413636 if you wish to discuss making changes to the colour.